PHNOM PENH, Apr 24 2017 (IPS) - Mao Neav takes a few quick steps out into the field, followed by her faithful dog Onada, tail wagging, tongue out and panting, ready for what is out there. The field is peppered with cluster bombs. Mao Neav is the leader of a small group of bomb and mine clearers working in the Ratanakiri province of north-east Cambodia. 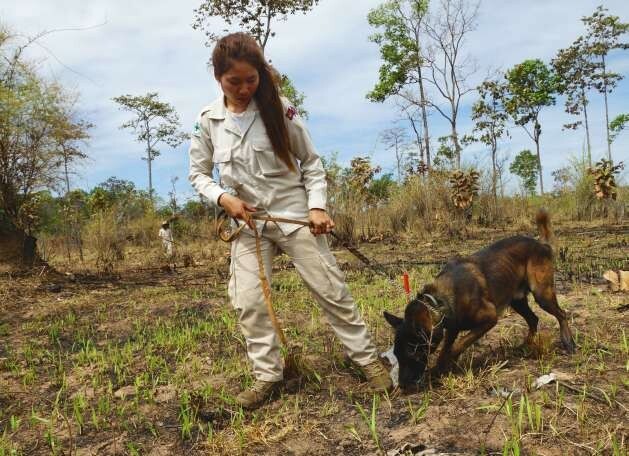 Her job for the past two years has been to clear the bombs and land mines that litter what was once part of the so-called the Ho-Shi-Minh trail. With the Vietnamese border only 70 kilometres away, this area was part of the logical system that routed supplies for the North Vietnamese troops during the Vietnam War. The total amount of land mines in the country is estimated at around 4 million, thus making Cambodia one of the worst sufferers of undetonated bombs and mines in the world.